Note: If your chapter is not listed here we did not receive an annual report this year. Please check back in the spring of 2013 for information on submitting 2012-2013 annual reports. Activities: Field trips to Sycamore Canyon swimming hole, Vulture Mine abandoned gold mine in Wickenburg, geocaching, and Biosphere II in Tucson. Also hosted an end-of-year picnic. Once again, we wrote trivia questions for the Tempe Geography Bee. Activities: Joining our already significant number of GTU members, we had the following new initiates: Erin Carman-Sweeney, Julia Dittrich, Ellen Esling, Joshua Kunde, Johannes Mack, Christopher Peters, Santosh Rijal, Adam Shaffner, Kushendra Shah, Melva Trenino-Peno, Makayla Trotter, and Ryan Wendel. Many of these took over leadership roles. Activities included "Chalking" to advertise Earth Day events, participating in numerous community Clean Up projects, helping with an Adopt a Trail location in our near-by National Forest, and Reading for the Environment (going to elementary schools to read about earth friendly behavior). Our GTU is actively linked with our Geography Club and many members organized and participated in the Earth Extravaganza held at Campus Lake on Earth Day. This was a fun, free educational event for kids. Activities: The University of Kentucky Sigma Chapter had an eventful 2011-12 academic year. Our service to the community included volunteering each month at a local soup kitchen, which serves approximately 100 homeless persons each week. Through this process, we were able to persuade several other undergrads, graduate students and faculty to assist. In early 2012, we were honored that Elizabeth Rebmann, one of our graduating seniors and a member of GTU, was awarded the Algernon Sydney Sullivan award. This recognition, presented by the University of Kentucky President, is intended to reward those citizens and students who exhibit a “spirit of helpfulness and an awareness of the beauty and value of the intangible elements of life.” Elizabeth was selected for this award as a result of her actions in Lexington, which included after-school tutoring, establishing pump-side recycling at a local convenience store and gas station chain, and volunteering with Habitat for Humanity. While in Afghanistan as a member of the Kentucky National Guard, Elizabeth worked with Afghan women and taught them to grow saffron, a high value cash crop that could be substituted for poppies, which were developed into opium. Elizabeth also worked through her hometown church to collect warm clothing, including winter coats, as well as a school supplies, that she then donated to Afghan village children. The UK Geography family was proud to see our student granted such a prestigious award. During Geography Awareness Week, GTU members helped organize Geo-Jeopardy, modeled after the tv game show. Players from across the university were solicited, and plans for upcoming GAWs include inviting celebrity participants, like the 2012 NCAA Championship Kentucky basketball coach. Activities: We initiated 7 new members to the chapter and elected new officers. We held three meetings to reorganize and set an agenda for future service projects in the Fall of 2012. Activities: In collaboration with the Department’s Geography Club the Chi Chapter sponsored an international beer, wine and cheese party. In coordination with the Forum of Geography Graduates (FOGG), the Chi Chapter sponsored an hour-long practice session for the 2012 AAG Annual Meeting. Three graduate students participated in the event, and received valuable feedback from those in attendance. For the first time, the Chi Chapter adopted two Angel Tree Kids to help less privileged children to a happy holiday season. 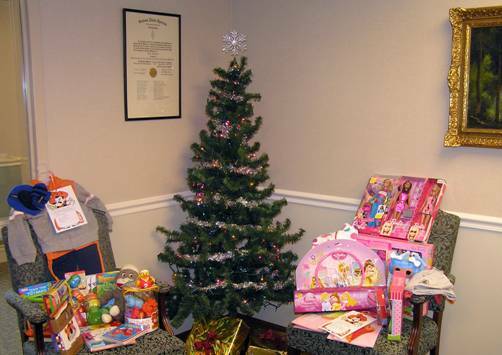 Oklahoma State University sponsors the Angel Tree program, which collects Christmas gifts for less privileged children. From the chapter’s Keurig coffee maker proceeds and donations from chapter members, we were able to provide several requested gifts for a young boy and girl (See attached photo). In May 2012 the Chapter inducted several new members during the Department of Geography’s end of the year event. Activities: Summer semester 2011 found the Geography Club and GTU busy testing out a new student involvement and service learning model, initiated by chapter president Kaila McDonald, called a “mapping party.” The first three mapping parties, held during summer semester, were well attended by undergraduate students in the Geography Department and in the Environmental and Sustainability Sciences Program. The mapping party was held to help the University of Utah's Facilities Department ground-truth existing spatial information regarding entrances to campus buildings for the purpose of handicapable/handicapped routing. Several half-day mapping parties were held using donated Trimble GeoXT GPS (Global Positioning System) professional grade units on loan from the University's DIGIT (Digitally Integrated Geographic Information Technologies) Lab. Lab Director, Phoebe McNeally, and GIS (Geographic Information Systems) Coordinator for the Facilities Management Department, Darrin Blaisdell worked with a student throughout the summer as a GIS intern (as a direct result of the mapping parties) to continue working on this project. To kick off the fall 2011 semester the Geography Club, along with GTU, the graduate and undergraduate SACs (Student Advisory Committees) participated in the University's Plazafest Welcome Week and manned a table promoting the clubs and the Geography Department. In November the groups worked together to organize, present, and celebrate “Geography Week and GIS Day.” During the week some of the activities enjoyed were, a movie screening of BBCs “Human Planet,” and a colloquium: "How to Map Practically Anything: Towards a Cartography of High-Dimensional Space” presented by André Skupin, as well as a GIS demonstration. In December, curator of the Natural History Museum of Utah's Herbarium and Geography Department faculty, Dr. Mitch Power generously volunteered to step in as faculty adviser for the club. Spring Semester even started with a VIP tour of the new Museum of Natural History, hosted by Dr. Power. In February, club President Kaila McDonald, presented the clubs' mapping party model at the annual AAG (American Association of Geographers) conference in New York, New York in conjunction with Pennsylvania State University GTU. The presentation was part of a student panel presentation hosted by Penn State University at the conference called “Undergraduate Students Doing GIS.” In March, the club hosted a mapping party for the Natural History Museum to help map and remove invasive plant species in a study area directly behind the Museum's new facility on the slopes of the Wasatch mountain range. The mapping performed and data obtained by the club will help the museum and Dr. Power quantify and determine if the current invasive species remediation techniques will prove to be successful. In May the club threw a mapping party to help a graduate student map a cluster of pine trees in a local Wilderness Area. GTU is planning additional mapping parties and service projects with federal and local agencies as well as University departments. The club actively seeks out projects of an educational and service nature, while attempting to promote GTU and the Geography students of the University of Utah to the local community. Individuals and students can stay “in the know” by joining the University of Utah's Geography department email list, or by joining the Geography club's email list, or by friending the club on Facebook (both are new additions to the club this year. Activities Activities included participation in Geography Awareness Week, GIS Day, and the Career Fair. Activities The 2011-2012 academic year marked the 50th year of the Alpha Phi GTU chapter at the University of Nebraska-Lincoln (UNL). Thirteen Geography students were inducted into GTU in the Spring. The induction ceremony was highlighted by guest speaker Scott Josiah of the Nebraska Forest Service, who presented a talk on the Forests of Nebraska, and examples of the tools of geography that have been used at UNL over the past 100 years as well as historical photos and information about the history of GTU at UNL since 1952. During the 2011-2012 academic year, students involved in GTU also supported the home school Geography Bee in Lincoln, as well as promoted Geography at prominent UNL outreach events that included Weatherfest and the Geography Bowl as part of Geography Awareness Week. Activities This year, the Alpha Psi chapter of GTU worked in conjunction with the graduate representatives to sponsor several events including game nights, happy hours, end of the semester get togethers for the holidays and graduation, and we were able to increase our membership by eight new students and faculty. The most significant achievement is the initiation of talks regarding departmental student leadership. Beginning each fall, the graduate student leaders for GTU, Graduate Representatives, and The United Government of Graduate Students will come together to discuss our goals, objectives, and responsibilities for the upcoming academic year. We anticipate that this will increase our overall participation in events, leadership roles, and collegiality of the department. Faculty Sponsor: John Harrington Jr.
Activities: The highlight of the year was our annual banquet in April. Cheryl Blake, a K-State geography grad currently working for the National Geospatial Agency, gave the after dinner address on “The Power of GEOINT.” During the academic year, GTU helped out with Telefund, the university fund raising campaign, the group again participated in Adopt-A-Highway, Geography Awareness Week, and helped with the Kansas Geographic Bee. The GTU speaker program again included several brown bag lunches. During the annual Alumni Weekend in late October, GTU provided the cash awards for the three winners in the chili cookoff. In order to make money to support group activities, they designed and sold new K-State geography t-shirts, stocked a refrigerator in the department and sold 12 oz. soft drinks, and provided food service for the annual Kansas Geography Education Conference. Nine individuals became new members of the Beta Psi chapter of GTU during the 2011-12 academic year. Activities: Initiated six people in the Spring semester. Activities: GTU remained a vital presence in the Geography and Regional Planning Department, with its weekly hot dog sales and several movie nights. GTU members participated in a highly successful annual meeting of the Pennsylvania Geographical Society, hosted by our department. Successful fundraising efforts supported approximately ten club members who attended the AAG meeting in New York. This was definitely the highlight of the year, and the students traveled to the Big Apple in style, by rail. In April, the annual banquet and introduction of new members was held at a ski lodge owned by the IUP Student Co-Op. IUP biology professor Jeffery Larkin was the featured presenter, and his talk “Mitigating the Impacts of Oil and Gas Development on Pennsylvania's Forest Ecosystems” highlighted his research into reclaiming bird habitats in Appalachia disturbed by extraction activities. Our numbers remained stable with the addition of twelve new members and the loss of eleven graduating members. The latter included club president Kathleen Oldrey (B.A. ), vice president Elizabeth Thomas (B.A. ), and secretary Lacy Hepler (B.A.). Also graduating was Adam Nelson (M.S.) who received the Gamma Theta Upsilon Award for Excellence in Geography. GTU graduates Leslie Bolich, Lacy Hepler and Dana Turgeon shared the Outstanding Senior Academic Award, while Elizabeth Thomas was recognized as the Inaugural Diane & Daniel Griffith Scholarship Graduate. Bear Point Bayou Restoration Project: This still current project is the restoration of the bayou on campus to provide a better environment for wildlife in the area, and a basis for classroom studies. This project will also incorporate plaques for taxonomy of plants and wildlife, for visitors to the campus. Nature Trail Creation: The project is to provide instructors, students, and visitors to the campus a scenic trail in which wildlife can be observed in their natural settings, while ensuring the preservation of their habitats. The goal of this project is to get approval from the Audubon Society to be an official Audubon Nature Trail. Community Gardens (planning): In conjunction with EcoEAGLES. The project is in the planning stages, and it is designed to provide the University with a garden which can provide a basis for study, while allowing for the production of fruits and vegetables on the campus. Ship Island debris cleanup: volunteer work with the National Park Service to help with the cleanup of litter and debris from West Ship Island. Jazz Fest: Worked a game to help raise funds for the organization and to promote Geography. Black Creek Cleanup: In conjunction with GTU Hattiesburg, volunteer work to cleanup up litter from a local creek. GIS day: Passed out pamphlets to local community colleges, high schools, and technical schools highlighting different job fields within Geography. This project was designed to promote Geography to potential future university students. Activities: Our chapter was somewhat inactive this year due to our previous sponsor going on medical leave unexpectedly. Members presented papers at McNair conferences and the annual meeting of the AAG. Members joined the department sponsored club, GeoCats, for field trips and for seminars given by previous graduates of the department focusing on job possibilities in geography. Activities: The Iota Phi chapter of Gamma Theta Upsilon (GTU) at the University of Florida was able to increase knowledge of the organization and the Geography Student Organization (GSO). We have focused on increasing the amount of attendees of meetings. Combined meetings with the Geography Student Organization have increased attendance markedly in the last year. Each of these meetings had presentations the aim of which aim was to present something that will help members succeed in the future. We are communicating through our Facebook page and through our faculty advisor and majors’ list-serve. In 2012, the chapter had an initiation with 3 new members (Hannah Herrero, Stephanie Zarkis, and Tyler McCann). While the increase in attendance of meeting is not reflected in the number of inductees, this is because many of the attendees do not qualify yet and it will be seen in inductions in the next several years. We worked to increase group solidarity and interaction between members this year which has assisted in increasing our meeting attendance. We did so by attending a variety of events including sports events and plays at the Hippodrome (a local historic theatre). We made sure to support one of our fellow geography students as well who is on the gymnastics teams. The most impressive outing however was the completion of the Lake Wauburg Challenge Course and Alpine Tower, a group challenge that was well publicized and built companionship between GTU and GSO members. Activities: This spring we added 5 new members at the GTU initiation dinner. The dinner was attend by 5 past GTU initiates and 10 current and retired Geography Faculty, and the Associate Dean of the College of Humanities and Social Sciences. Activities: For the 2011-2012 Academic year, the Kappa Xi Chapter of Gamma Theta Upsilon took on the challenge of creating a student Atlas specifically targeted for new students at New Mexico State University. This Atlas would allow new students to have a reference for not only academic maps and locations but also for locations around town that offer amenities such as restaurants that give student discounts, free Wi-Fi and plug ins for lap tops, recreational areas, and bike paths, to list a few. This project was begun on September 2011. Data were collected and analyzed. Midway through the project, faculty members asked if we could provide them with our data for use for an atlas for the upcoming Southwestern Division of the Association of American Geographers (SWAAG) which will be held at NMSU in October. The maps will be geared toward conference attendee use. Four new inductees, Suzanna Montes, Kyle O'Neil, Randolph Curley and David Silcock, joined the chapter. Three masters students, Leandro E. Gonzalez, Kelly Merker and Daniel Estrada, were conferred their hoods and recognized as graduating students. Graduating undergraduates, Rebecca Martin, and Mark Simpson, were also recognized. All graduating members were awarded stoles and honor cords. Outstanding geography Alumnus Pamela Pick was recognized and awarded by Kappa Xi Chapter for her contributions to geography and our students. New officers for the 2012-2013 Academic year were elected. President: Alanna L. Jentgen, Vice-President: Nick Damon, Secretary: Christy Bankston, and Treasurer: David Silcock. Attended the SWAAG regional conference in November as part of multi-day field trip to Texas that included touring two campuses, geocaching, and hiking Enchanted Rock in Central Texas. Activities Given the small size of our chapter in 2010-11 (five members), we are proud of our accomplishments. In March, we hosted a Career Day, which brought back to campus six students, four of whom were former GTU-DM members, to speak about their careers in geography. On April 18, we co-hosted the annual Geography Department symposium, which had 10 student presenters and a poster session. The day was capped off by our annual banquet, where we inducted five new members. Activities We initiated new members and had an initiation dinner. Activities: One new student was inducted into chapter May 2012. Activities: The Zeta Xi chapter plays an important role in building a community for undergraduate and graduate students in the Department of Geography and Planning at the University of Toledo. In Fall 2011 we had a movie/pizza night, and watched Mountains of the Moon. Fall Semester GTU initiation was followed by a “Geopardy” competition (both students and a handful of faculty members participated). All of the Geopardy categories were geography-related, including round one that focused on the United States and round two expanded to the global arena. Similarly, in Spring 2012 we had an informal viewing of several episodes of Long Way Round Journey with Ewan McGregor and Charley Boorman (a documentary of their 20,000-mile journey on motorcycles across Europe, Ukraine, Russia, Kazakhstan, Mongolia, Siberia, Canada, and the United States) and a potluck dinner at the GTU faculty sponsor’s home. Along with Spring Semester GTU initiation, we had another “Geopardy” competition because it was so popular the previous semester. For outreach, several members of the Zeta Xi chapter volunteered to serve as ambassadors for the Department during “Major Palooza,” which is designed for all undecided undergraduate majors at the university. Besides handing out recruiting materials to prospective students, they talked to them about geography and career opportunities. Activities: GTU remained dedicated to maintaining the Candace Scola memorial garden that commemorates a student from our department who was a victim of violence. GTU met several times throughout the year to keep up the garden as well as to gather socially on a few occasions to watch movies and eat pizza. GTU participated in geography awareness week. Over the summer we plan to get together for a BBQ and to discuss a fund raising initiative for a grammar school in Tanzania near the field research area of our department chair. Activities: We held our Spring Social and Initiation Ceremony in April. During this event, we initiated 3 new students into our chapter and played a rousing team game akin to a Geography bowl. We also awarded one of our graduating GTU members (Jason Folkman) with the NCGE/AAG Excellence of Scholarship Award. Activities: This year we welcomed eleven new members to our Chapter. Old and new members, as well as faculty attended the reception for our new members. Last year two of our chapter undergraduate students attended the APCG with a graduate student member. Prior, GTU had done workshops for undergraduates on how to do professional presentations. Later that year we started on design and content for our mentoring program, which is going to be connected to the department website. The mentoring program is meant to create support for undergraduate students, a space where students can get information and further support in their academic careers. Both graduate and undergraduate students have volunteered to provide photo and biographical information for the website. We are hoping that this can provide alternative support for students; for example, we have students who are parents or nontraditional students who can provide support and answer questions for undergraduate students in similar situations. Our Chapter has also committed to help with the development of the School’s alumni website. Over the last year, our chapter has helped the undergraduate club in Geography and Development on community outreach at Manzo Elementary School and their ecology club. Activities: Thirty-three undergraduates who fulfilled the GTU selection criteria were invited to join the Eta Alpha chapter. Eleven accepted the invitation and were initiated at a special luncheon in their honor during Geography Awareness Week. At the Geography Department’s annual Appreciation Banquet, eight graduating GTU seniors were presented with their GTU cords. As in previous years, one of the Outstanding Senior awards and one of the four Globe awards (for either academic excellence or service to the department) presented by the Department during this Banquet were won by graduating GTU seniors. Another GTU graduate won the Glen Elder Award in recognition of her work on social justice, sexuality, South Africa or political geography. Students designed new chapter t-shirts. Keynote Address by Joe Riis from National Geographic. End of the year Geography Spring Banquet in which 5 new GTU members were inducted and next year’s officers were introduced. Activities: The Chapter co-sponsored a Global Change seminar series in conjunction with the senior environmental seminar course. As part of the series, a group of scientists from Villanova, University of Pennsylvania, and the Florida International University conducted a series of seminars that addressed various salient environmental issues––this year’s focus was on water and the environment. A total of four seminars was held during the spring term. Students and faculty from across the College attended the seminars. The Chapter sponsored a seminar/panel on internships, REUs, and other summer programs in November. The purpose of this seminar was to provide information on summer opportunities for students in the department, as well as tips and lessons learned to help with the application process. The panel consisted of 6 students and 2 faculty. The Chapter hosted its annual induction ceremony in April as part of the Department’s annual graduation and awards ceremony. This year, the Chapter inducted 2 honorary members and 21 regular members from among the junior and senior classes. Activities: In this rebuilding year—many of our GTU members graduated last year—twelve new GTU members were initiated into Eta Chi during Fall 2011, and ten new GTU members joined in Winter 2012. We are excited to have a growing group of enthusiastic students. GTU hosted a “Graduate School Interest Night” in Fall 2011 to help students think about whether graduate school was in their futures and if so then what they could do to prepare. Two faculty members served on a panel for this informational session. A GTU initiation meeting and dinner in February convened eighteen of our members for pleasant conversation and planning. That same evening GTU teamed up with the Superior Geography Club to co-host a movie night. We watched Big River, a companion film to the King Corn documentary. We hope to co-sponsor more movie nights next year to raise awareness of various geographical and environmental topics. A highlight of our year was hosting Dr. Frederick (Fritz) E. Nelson for a public lecture. Dr. Nelson is an alumnus of Northern Michigan University, and we enjoyed discussing NMU in the 1970s versus now. GTU members and faculty mingled at a reception for Dr. Nelson after his presentation. The GTU president organized an evening hike up nearby Hogsback for a study break in April. Group members used a GPS to map their route, and they enjoyed the sunset at the top of the mountain with Lake Superior on the opposite side of the panoramic view. We are regaining numbers in the Eta Chi chapter of GTU and plan to carry the group’s momentum forward into the fall. Starting a Geography Peer Guides program to help advise underclassmen through the major. Activities: The Theta Xi chapter of GTU was dormant in 2009/2010, but the group was re-established for the 2011/2012 academic year. An initiation was held in November 2011 for 8 new members, with remarks presented at the event by the Department Chair, Dr. Steve Kite. The group’s main activity for the year was to develop a GIS for the West Virginia Coalition to End Homelessness. A map showing the facilities operated by the group throughout the state was created for use in presentations, brochures and other publications. The Theta Xi chapter also collaborated with the WVU Geography Club in organizing joint events, including a camping trip and participation in the Annual Meeting of the Association of American Geographers (AAG) in New York. Activities: Students attended the Southeastern Division Association of American Geographers (SEDAAG), and participated in the World Geography Bowl team (pictured below). Three GTU students attended the Annual Meeting of the Association of American Geographers in New York in February, 2012. In February and March, GTU members and Geoscience Club members participated in mapping illegally dumped tires in seven of Atlanta’s poorest neighborhoods. In total, over 3500 tires were mapped and collected in a large, community-driven effort. GTU also co-sponsored a Spring 2012 lecture series titled “Cities in Crisis.” Three leading scholars in geography visited the GSU campus, including Dr. Meghan Cope from the University of Vermont; Dr. Anne Chin from the University of Colorado, Denver, and Dr. David Wilson from the University of Illinois, Urbana-Champaign. Lastly, the GTU club gathered together for an end-of-year camp-out in April of 2012 with GTU members from the University of West Georgia and University of Georgia. Activities: Three new members were inducted in 2011-2012. Major activites of the GTU chapter were muted this year as the recent accreditation of our Geointelligence Certificate by the USGIF took center-stage in the Department. Our GTU chapter held two initiation ceremonies this past academic year, with two new members coming aboard last December and seven new members taking the pledge this April. GTU sponsored a fascinating speaker, Dr. Melissa Conner from Nebraska Wesleyan University. Dr. Conner is a forensic anthropologist who gave a very well-attended presentation on her work unearthing and documenting mass grave sites around the world where acts of genocide have taken place. Activities: In an effort to advance the spirit and purpose of geography, while also seeking to make a significant contribution to society, the Lambda Upsilon chapter of Gamma Theta Upsilon (GTU) engaged in a number of activities throughout the 2011-2012 academic year. Members participated in academic conferences, hosted visiting distinguished speakers, took part in field trips, and raised funds to ameliorate gender disparities and foster development in Africa. In September, New York Times columnist Nicholas Kristof was honored with the award of honorary membership to the GRCC chapter of the International Geographical Honor Society during his visit as part of the institution’s Diversity Lecture Series. A number of chapter members were invited to a special reception in his honor and met him before his lecture. Mr. Kristof was interviewed by the chapter sponsor, Mike DeVivo, which continues to be broadcast on GRCCTV: http://www.youtube.com/watch?v=A_ogkRbUKwA&feature=plcp. In March, the Lambda Upsilon chapter hosted Kate Swanson (San Diego State University) as the distinguished Visiting Geographical Scientist sponsored by GTU. Professor Swanson delivered a keynote lecture at the GRCC Annual Race and Ethnicity Conference (http://www.youtube.com/watch?v=YA2leisK_hU&feature=plcp), which was devoted to her fieldwork in the Andes. All of the chapter members took the opportunity to discuss with Professor Swanson her field research during a dinner held on her behalf, and all remarked that she was a great inspiration. Her interview also continues to be broadcast on GRCCTV: http://www.youtube.com/watch?v=e4hc5rN9YZg&feature=plcp. Members of the chapter made presentations concerning their geographical fieldwork in the U.S. and abroad at the Race and Ethnicity conference as well; Kara Apodaca, Lindsey Harris, and Sarah Nusbaum presented aspects of their fieldwork in South Africa, which included videotaped interviews of indigenous people. Adrienna Ozinga and Brian Woodin discussed the geographical character of ethnic groceries in western Michigan: http://www.youtube.com/watch?v=tMtNxP6tx1A&feature=plcp. Moreover, in April, these five students delivered papers at the Annual Meeting of the California Geographical Society in Davis and participated in field studies devoted to the geography of viticulture and enology. Following the conference, a field trip to Yosemite National Park took place in which the chapter members took part in a number of hikes, learning much about water resources, fire ecology, and the geomorphic character of the Sierra Nevada Mountains. Throughout the year, chapter members had participated in organized field trips in Michigan, learning about wastewater treatment, viticulture and wine, and the urban geography of Grand Rapids. Ms. Apodaca, Ms. Harris, and Ms. Nusbaum conducted substantial fieldwork during a study abroad experience in South Africa, where they studied society and the environment in four distinctive provinces (Western Cape, Gauteng, Mpumalanga, and Limpopo) and took part in numerous safaris viewing African wildlife. Yet it is notable that the most important activity engaged in by this GTU chapter might have been its effort in continuing to build upon the foundation that was laid down by previous years’ students who sought to generate support for female education in Africa. In collaboration with the GRCC public relations office, the chapter web site was developed to be largely devoted to raising funds for the education of African girls (http://cms.grcc.edu/gtu4africangirls). The Grand Rapids Press, western Michigan’s leading newspaper, and a local television station reported on their activities, as did the college newspaper. All chapter members worked together tirelessly, selling T-shirts, buttons, and arranging a public viewing of Where the Water Meets the Sky, a documentary narrated by Morgan Freeman devoted to empowering women in Zambia by enabling them to produce their own film, telling their personal life stories. A benefit show was organized at Billy’s Lounge, a local tavern, which not only raised money but also fueled awareness throughout the community of the need to educate girls in Less Developed Countries. The end result of Lambda Upsilon’s campaign proved to be remarkably successful; enough funds were raised to send twelve girls in East Africa to school, as all donations have been pledged to CAMFED (Campaign for Female Education: http://us.camfed.org/site/PageServer?pagename=home_index). Honors went to each of the chapter members at the GRCC Student Leadership Banquet in May. All five received financial awards in the form of Geography Lives! Field Studies Scholarships, in addition to Lambda Upsilon Academic Service Awards, and Lambda Upsilon Global Citizenship Awards. Kara Apodaca received the Lambda Upsilon Leadership Award for demonstrating exceptional transformational leadership attributes and Brian Woodin received the GTU Excellence in Geography Award, for his academic achievements. The Lambda Upsilon members demonstrated a high level of passion in their efforts to contribute to humanity, while also generating sound scholarship and field study in the practice of Geography. They showed their local community why Geography is important by taking their learning from the classroom and applying it to make a difference for girls in Africa. In essence, they practiced Geography for a better world, and their work has been exemplary. Activities: As a small department we try to combine our efforts with the Geography Club. A large number of students graduated in December and in May, and many current student members working or completing internships. As a result, both the Geography Club and GTU Honors Society were inactive this year. Activities: The Department of Geography and Environmental Studies at California State University, San Bernardino founded its chapter called Lambda Chi in November, 2010. Since, November 2010 the membership has increased to twenty one members. The Chapter also celebrated Geography Awareness Day along with induction of several members. Students participated in a photo competition and the best voted pictures were awarded. Dr Bo Xu (faculty member) gave a talk on ‘China: The Once Developed and Developing Country’. 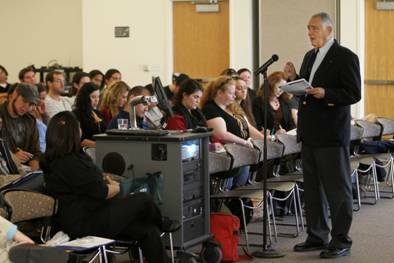 In November 2011, Professor Waldo Tobler was as an honorary speaker during the Geography Awareness Day (see photo below). This event was jointly sponsored by Cal Poly, Pomona. This invitation was co-sponsored by the Visiting Geographical Scientist Program (VGSP), AAG and Lambda Chi Chapter, Gamma Theta Upsilon. The title of Professor Tobler’s talk was - Migration: Map and Models. His lecture was well attended by senior administrators, faculty, staff and students. He also participated with our students and faculty in the Lambda Chi initiation ceremony of new members. Professor Tobler’s visit was a huge success and we look forward to inviting other VGSP speakers to our campus in the future. Lastly, the student association of geography and environmental studies (SAGES) organized a university wide geography quiz and the winners were recognized. Activities: This year DePaul University’s Mu Alpha chapter of Gamma Theta Upsilon has been active in enhancing connections between all students interested in geographic studies as well as promoting sustainability on campus. Early in the school year, the chapter president founded an all-inclusive geography student group called the DePaul Geography Student Association (DGSA). Through this group, geography majors, minors, GIS certificate students, and all DePaul students interested in geography are able to get connected and learn about professional, academic, and recreational resources and opportunities in the Chicago area. Geography major Mia Robidoux, President of DGSA for the 2011-2012 year, has greatly contributed to enhancing student communication by founding the first Geography newsletter, Passages. The first issue can be viewed online at http://us5.campaign-archive1.com/?u=2d0e84b6c2eb6803dd470a946&id=97c9afca8c; the group can be reached through facebook and online at geblography.org. Mu Alpha has also encouraged sustainable practices on campus by co-sponsoring events with the DePaul Urban Farming Organization such as the groundbreaking of the University’s first urban garden, a student run project which advocates food security through education about local food systems. Activities: The Mu Delta chapter of Gamma Theta Upsilon was founded in the Department of Geography and the Environment at the University of Richmond concluded its second year. In this second year of existence, the chapter is made up of 12 members. Due to our new major, small size, and high percentage of students studying abroad in their Junior year, we still have no student leadership. To date our activities in 2011-12 have consisted only of an induction ceremony and celebration, as we work towards incorporating the chapter in our University system of student organizations. Activities: The club had two major activities in the fall semester. The first was a Geoscience polo shirt fundraiser. This began because the faculty wanted polo shirts, but the GTU expanded the orders to students and was able to make about $125 in profit by charging a little more than the shirts cost. The other big event was the first (hopefully annual) Geoscience Student Symposium. This was held in November and had six oral presentations and seven poster presentations. Richard Carley won first place in the oral competition with his presentation “Oil Spill Effects on Fires in Mississippi and Louisiana Marsh” and Erik Larson won first place in the poster contest with his poster “Karst Features on the Hiawatha National Forest, Upper Peninsula, Michigan.” The event was well attended by students and faculty. Eight new members were inducted into the Mu Eta chapter in November followed by dinner at Mi Hacienda. Less activity took place in the spring semester, and was mostly social. This included a movie night and dinners. The year concluded with a meeting to plan activities for the following school year. Since the chapter is new, the top priority is to grow awareness and increase the membership. The group especially needs to increase the number of students who are active participants. The members are planning a lunch for new graduate students during the first or second week of school to let them know about GTU if they haven’t heard of it and that they can remain active with the organization at MSU if they were inducted at their undergraduate school. They also plan to do the symposium again. Activities: Celebrating its first full year as a new GTU chapter, the Mu Theta chapter at Park University inducted seven new members into its second class in April. The charter class of the Mu Theta chapter consisted of 14 members, who were inducted in April 2011. Over the course of this year, the new officers of our chapter played a central role in leading the efforts of our university’s GEO Club, which helped organize and sponsor events for Geography Awareness Week in November and Earth Day/Week in April. Geography Awareness Week events included hosting an “Organic Pancake Brunch” (which served as a fundraiser), a “Global Sustainability Film Fest,” and beginning a community service project to help map and preserve the Old Parkville (Mo.) Cemetery. Earth Day/Week activities included supporting the university’s “Earth Day Environmental Fair,” participating in Kansas City’s 16th annual EarthWalk, and distributing Earth Day awareness bracelets on our campus. In addition, members also helped promote and attended the annual SkyWARN storm spotters presentation held by the National Weather Service on our campus in March. And in April, they teamed up with students from the university’s Biology Club to take a specially arranged “behind the scenes” tour of the Omaha (Neb.) Zoo. Activities: This was our inaugural year. We held two initiation ceremonies; in November ten students were initiated and in April three were. The chapter did not undertake any other activities this year. Activities: Mu Kappa was initiated in May. Six students and three professors were inducted into Gamma Theta Upsilon during a ceremony. After the formal part of the ceremony was completed, a buffet lunch was served, and Dr. Wiley gave a speech about the history of the department, especially focusing on the significant growth of the Geography program from one course more than seventy years ago to today’s myriad of regional and topical geography courses taught by five full time professors and three adjuncts. After the speech, the students had a chance to talk with each other and the faculty about future courses and career opportunities, and we exchanged ideas about possible future activities for the Mu Kappa chapter. Activities: We inaugurated the chapter and inducted our first class of initiates--3 students, 3 faculty, 1 dean. We are proud to be one of the very few community/junior college chapters. We're contemplating strategies to foster a thriving chapter given the small number of eligible members inherent to the community college setting. One idea is to initiate a geography club and see if the club and GTU might be complementary.